Jan. 30, 2019 12:43 p.m.
“Loxy Ladies” Katherine Hamill and Ainsley Nesrallah are hard at work preparing for their next cooking demonstrations, where they’ll be dishing out favourite recipes made with the very best ingredients from their family business — Cloverdale’s Sundance Seafoods. Hamill and Nesrallah are sisters who grew up in the family fishing business. When Sundance Seafoods first launched, it was run out of one room in the sisters’ childhood home in Ladner. “We’ve always kind of had one foot in,” she said. The company outgrew their family home, eventually moving into the current facility in Cloverdale, located at 17350 56 Ave.
Now the sisters are all in. Nesrallah worked as a paralegal before joining the family business full-time in June 2014, and Hamill was a dental hygienist before she joined about a year later. Now Nesrallah is an executive assistant, and Hamill works in sales. In reality, they work on a “bit of everything,” explained Hamill. Loxy Ladies is one of the projects they lead together. They launched Loxy Ladies on Instagram when the platform began to take off. 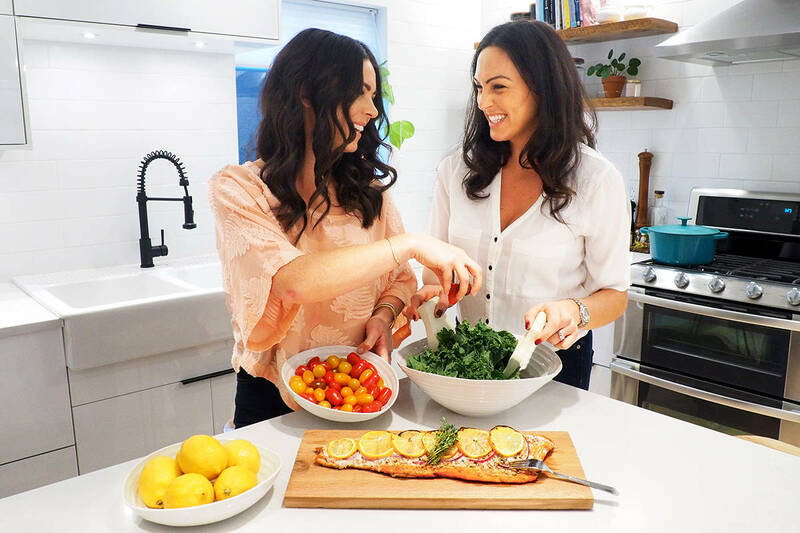 Although their name is a playful turn on lox — a fillet of brined salmon — the sisters deal with all kinds of salmon and seafood. The two wanted to find a way to share beloved family recipes with customers, and it was a question that the two were asked often at trade shows, “‘Oh what can you do with this?’” said Nesrallah. Their Instagram @west_coast_select is an outlet where the two share long-loved family recipes and new creations that they’ve whipped up. The cooking duo demonstrates at many local trade shows, but the Vancouver International Boat Show is one of their favourites. Show organizers reached out to them before their first appearance, and asked if the sisters could demonstrate how to put together meals and appetizers in a boat-size galley kitchen. The Loxy Ladies, who are often on the family boat, know a thing or two about putting together a delicious meal out on the ocean. At the show, Hamill and Nesrallah will be demonstrating how to put together an easy appetizer board for entertaining at sea, and will be sharing a family recipe for chowder as well. The show runs from Wednesday, Feb. 6 to Sunday, Feb. 10. The Loxy Ladies will be doing a live cooking demo on Friday, Saturday and Sunday at 2 and 4 p.m. If you miss the demo itself, you’re free to check out booth 447 where they’ll be dishing out samples of Sundance Seafoods products. Nesrallah and Hamill are one of 250 exhibitors that are booked for the show. For more information on the Vancouver International Boat Show, including hours, locations and ticket sales, visit vancouverboatshow.ca.